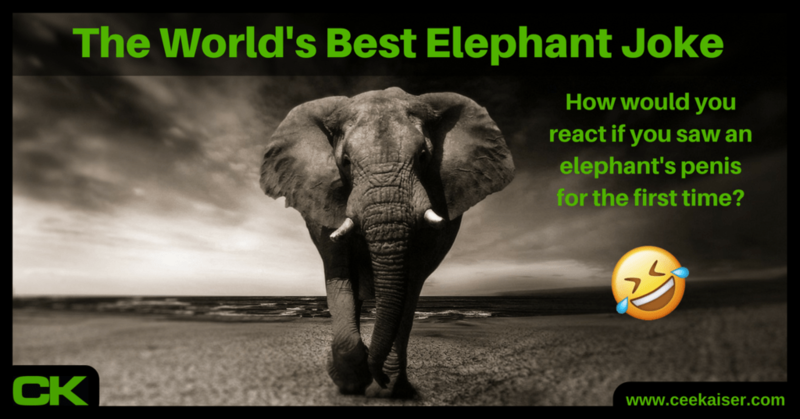 Having worked with elephants since 2012, I often get asked what the world’s best elephant joke is. Little Max and his mum visit the local zoo for the first time. Little Max is fascinated by all the exotic creatures he sees for the first time in real life. He stares up the giraffes’ long necks. Laughs at the funny monkeys. And begs to take a cute baby bear home. All he gets is an ice-cream. Good beginning. They stroll along, and suddenly find themselves staring at the elephant enclosure. Max is immediately intrigued by the gentle giant. He admires the huge tusks. The massive ears. The muscly trunk. The ever-moving tail. The… hold on. What is that? And with that she pulls Max over to the lions. Understandably, Max isn’t satisfied with the answer. A plan is forged. As mummy doesn’t want to tell him, he drags daddy to the zoo the following weekend. They rush past the giraffes, hardly notice the monkeys and completely ignore the bears. Max pushes straight to the elephant enclosure, and doesn’t hold back a second. Got a better elephant joke? Put it in the comments below or join our Facebook discussion on the world’s best elephant joke. Share some laughter! And share this joke with your friends. Everybody loves a good elephant joke. Care about elephants? Help plant valuable habitat for them. It doesn’t cost you anything when you opt for any of these simple strategies how to plant trees for free. No money of effort involved.